Nick is by far the best barber I have ever had! His attention to detail as absolutely amazing! Went for a hair cut back home and it was nothing close to the quality of Nicks haircuts. Love this place, I wont get my hair cut anywhere else after going here. Barber will hook you up right and is great at picking out a haircut when you're not quite sure what you want. Getting a haircut from Nick is MUCH more than just a haircut. Sure he gives the BEST precision haircut around but if you want (and only if you want), you can also get real estate advice, career advice, sports updates, new jokes and sometimes, a shoulder to cry on. I've tried many barbers who just didn't quite give me the consistent cut time after time. Nick's client files are updated overtime you go in so you if you want the same great look every time, Nick is the guy!! I have been going to Nicks for about a year now and could not be happier with my hair. Each visit is always great and I have never left unhappy. After your first visit, he'll write your haircut info on a note card to make sure that he gets your hair right every time. I get compliments on my hair all the time now. Nick is also a great guy and is always friendly. I can't recommend him enough. My interest in serving you is personal. Nick is one of the Top Rated Barbers in the area and boast’s 100% Satisfaction Rating. Originally from Ralphs Barbershop in Glenside and now in Jenkintown. 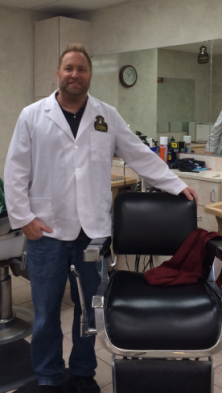 Nick is a Licensed Master Barber with over 23 years experience specializing in Precision Men’s Haircut’s. When it comes to personalized service Nick is unmatched by any barbershop in the area. He keeps a record of every clients personal haircut preferences. So when you return he knows exactly what you want every time! So if you’ve been trying to get a “Real” haircut from an experienced Master Barber with superior skills and personalized service you can Finally Relax! Click on the Book Appointment Now button Today!